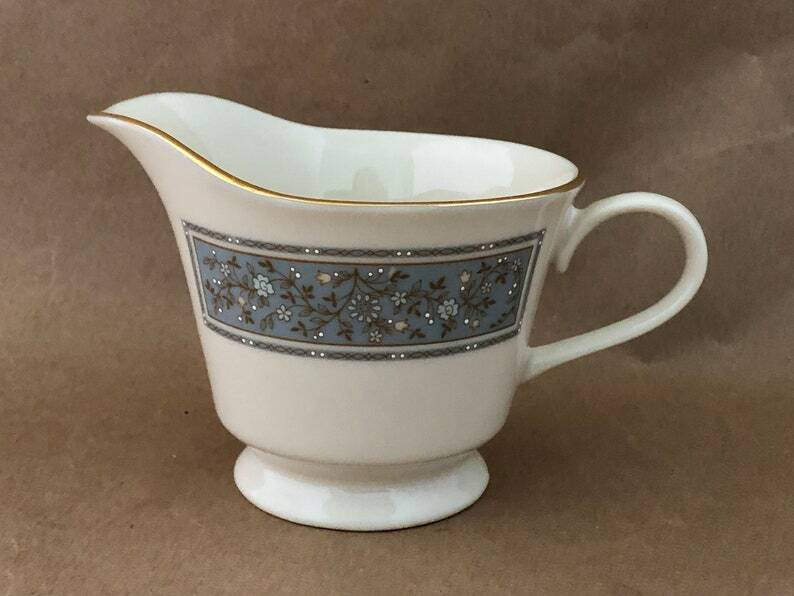 This is a beautiful ivory colored china creamer manufactured by America's highly respected Lenox China Co. It is part of the Lenox Exclusive "Rendezvous" pattern of fine porcelain dinnerware that was manufactured from 1977 - 1982 in Lenox's U.S.A. china manufacturing facilities. The gold trimmed cream colored creamer is decorated with banded rectangular panels on front and back that feature classical looking tiny pastel flowers joined by twining vines and accented by white dots or possibly berries. It's a very formal and sophisticated piece, but one that is neutral enough to beautifully blend with a more casual decor, especially when filled with a live air plant, fresh flower bouquet, or even potted succulents. Measurements - 3 1/2"high x 3 1/2" wide x 5 3/4" long from the outer edge of the handle to the tip of the spout. The creamer is marked on the bottom with the Lenox gold mark and the pattern name followed by the word "Exclusive" below and "made in USA". This hard to find piece is in beautiful condition with no flaws or damage. It is great for yourself or to give as a gift, and to be used as a display accent or to serve cream at tea time.